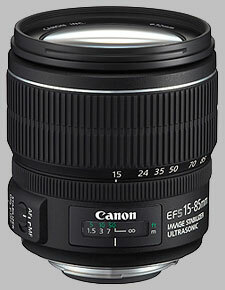 The Canon EF-S 15-85mm ƒ/3.5-5.6 IS USM was released in September of 2009, as a replacement for the EF-S 17-85mm ƒ/4-5.6 IS USM. The lens takes an optional petal-shaped lens hood, 72mm filters, and is available now for approximately $800. The 15-85mm shows very sharp results, even at its widest apertures. Used wide open at its widest angle (ƒ/3.5 at 15mm) we note a very sharp sweet spot of sharpness in the center, between 1 and 1.5 blur units. There is very light corner softness, approaching 2 blur units in the corners. As the lens is stopped down at 15mm this corner softness reduces, at the expense of the central sharpness; however, we're still looking at tenths-of-blur units, and by ƒ/5.6-8, the lens shows on average just less than 1.5 blur units across the frame. The lens also shows excellent performance throughout the mid-range and telephoto range of focal lengths. For the most part the results are similar throughout, a little less than 1.5 blur units in the center and less than 2 blur units in the corners. As before, stopping down improves sharpness performance: by ƒ/8, the lens shows almost tack-sharp results, at just over 1 blur unit at most focal lengths. Diffraction limiting sets in around ƒ/11, but sharpness is still good to even ƒ/16, showing 2 blur units or less across the frame. By ƒ/22 the lens begins to show somewhat soft results - at least 3 blur units, unevenly across the frame - and it gets softer as the lens is stopped down further. Fully stopped-down performance, up to ƒ/36 by 85mm, is very soft - 6 blur units. CA is well-controlled by the lens, particularly between 24mm and 70mm. At 15mm and 85mm, chromatic aberration results are statistically significant. At 15mm CA shows up a bit in the corners regardless of the aperture; at 85mm, CA is more prominent as the lens is stopped down. Corner shading is fairly prominent with this lens. At 15mm, corner shading is a factor regardless of the aperture selected, but is most noteworthy when used wide open at ƒ/3.5; at this setting, the corners are almost a full stop darker than the center. This improves to a half-stop by ƒ/5.6, and evens out at 1/3EV by ƒ/11 or smaller - thus, corner shading is always a factor. At other focal lengths, corner shading is only a factor at ƒ/8 or wider. At these settings we see a half-stop or less when the lens is used wide open at 24mm or 35mm; at other settings, corner shading is not an issue. As with most all-in-one zoom lenses, distortion results are complicated. Distortion is typically high for the widest angle setting (15mm) - almost +1% barrel distortion in the corners, and +0.5% on average. This barrel distortion evens out by about 20mm, where the corners then go towards pincushion distortion (-0.5%) at 24mm. After this focal length, there is some convergence, but distortion never comes to zero on either spectrum. With USM focusing, the 15-85mm ƒ/3.5-5.6 is very fast to focus, and nearly silent. Focusing from infinity to close-focus took just under one second. Autofocus results can be overridden by just turning the focus ring. The front element doesn't rotate during focus operations. Macro performance is average - 0.21x magnification, with a close-focusing range of 35cm (a little over one foot). For fit and finish, the 15-85mm certainly doesn't measure up to Canon's pro-grade glass, but then, the price tag doesn't measure up either. The lens construction may be plastic, but for its size it's fairly heavy - 575 grams (over 20 oz) - suggesting a durable interior chassis. The 15-85mm has a few more trimmings than less expensive lenses, including a distance scale set behind a plastic window, showing distance in feet and meters. There are no depth-of-field or infrared index indicators. There are two switches: one enables image stabilization, the other enables autofocus on the lens. The prominent zoom ring (1 1/8'' wide) is composed of a durable rubber, with a texture of segmented raised ribs. The ring takes only a turn of approximately 45 degrees to go through its entire range of focal lengths. The ring is fairly stiff and resistant to zoom creep. The design of the lens is such that as the lens extends its focal length the barrel physically extends, adding a further 1 5/8'' to the overall length at 85mm. The focus ring is much less prominent than the zoom ring - only 1/4'' wide - and is positioned rather at odds with much of the Canon lineup by placing it before the zoom ring rather than on the other side of it. The ring uses the same rubber ribbed texture, and offers a substantial range of movement - about ninety degrees of turning action. 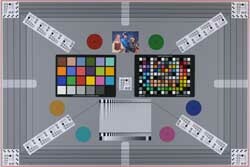 Either end of the focusing spectrum is bounded by a soft stop, and the lens will focus slightly past infinity. The front element doesn't rotate during focus. The main draw for this lens is its image stabilization feature, which Canon advertises will allow a shutter speed four stops slower than required for a shake-free image. Your mileage may vary with regard to image stabilization, but in our limited testing it does work as advertised. In-lens stabilization has the advantage over in-body stabilization systems in that you can see the effect working through the viewfinder, though with live view systems gaining prominence (and stabilization results being visible through them at the time of shooting), this technological advantage may become more marginal. The optional EW-78E lens hood is petal-shaped, and attaches to the lens with a bayonet mount. The lens hood can be reversed and mounted on the lens for easy storage. The interior of the hood is flocked to reduce stray light from hitting the front element. The new 15-85mm is definitely an improvement over the 17-85mm, offering sharper results at every focal length as well as distinct improvements with regard to chromatic aberration, corner shading and distortion. As well, you get 2mm wider, and a half-stop faster at the wide end. While not offering the same level of wide-angle as the Canon (17mm instead of 15mm), the Sigma offers a slightly faster lens with macro capability (0.43x magnification). The lenses are both quite sharp, with a nod to slightly sharper performance from the Canon; in the other categories (CA, corner shading and distortion) the Sigma fares slightly better. The Sigma doesn't feature image stabilization, though the price tag is lower. One of our perennial favorites, the Tamron 17-50mm is neither as wide or as long as the Canon, though it does offer a constant ƒ/2.8 aperture, and vibration-controlled (VC) model offers image stabilization, though at the time of writing, the Canon-mount model is not yet shipping from Tamron. Optically, the Tamron is as sharp or sharper than the Canon at the same focal lengths and apertures, and the same applies to resistance to chromatic aberration. Corner shading is also better with the Tamron, though distortion is about the same. With very good, if not excellent results for sharpness, resistance to chromatic aberration, distortion and corner shading, Canon has released an excellent general purpose lens. If you were looking for an upgrade to a kit lens and can't decide between wide angle and telephoto, this could be an excellent choice. I have had this lens for one and a half years, and it has been a nice mate for my camera. It is great: very sharp from 15 to 85 mm (although not so much in the corners at its widest aperture), very good at f11 for landscape photography. I must say that I compared it with the 18-55 and general differences are not so obvious, but colors are great and sharpness is better so if you can afford it and take photography seriously, I would recommend it. I was a bit concerned about using it for portraits, but when zooming at 85mm you get excellent sharpness and a pleasant bokeh, plus great colors; quite similar to the nifty fifty (the cheap but great 50mm f1.8). Corner shading is noticeable, but as I always shoot in RAW it is easy to correct with Lightroom; sometimes I don't do it because I like the vignetting in that particular picture. IS is great too: I have taken pictures at even 1/2 second that look sharp. Barrel distortion is there but you can always fix it with a click in Lightroom. I guess that everyone knows it when buying it, but it is not so practical for shooting in manual mode with available light because of the variable aperture, and it is a bit slow when shooting indoors, so you should probably use a flash or set the ISO to 800 or higher. But, aside from that, it is a great lens and I am very satisfied with it. I picked up this lens as a walk-around lens for my Canon 7D. As such it has fit the bill very nicely. IQ has been very good for my use as a walk-around lens. Construction isn't up to L glass but for the money its more than acceptable. If there is a downside at this point for me its that there is no camera/lens profile for Adobe Camera RAW and Lightroom. Distortion and CA corrections must be done manually. The best overall lens I ever had and I think this is the best "travel" lens you can have if you are looking for a sharp and smart lens. This lens will give you sharp pictures all the way. It is wide with its 15mm and it reaches mostly what I want with its 85mm. This is one my favorite and I use it if I need a zoom for travelling, indoor photo with flash (430 ex) or if I need to choose "one" lens to bring somewhere. I would not hesitate to purchase this lens. Sure it can seem pricy, but the quality feel and the sharp pictures it gives you it is only "expensive" before you buy it. Recommended for a APS-C Canon camera without a doubt. This is the best walkaround/travel zoom lens for Canon APS users (for fullframe I give it to 28-135IS). 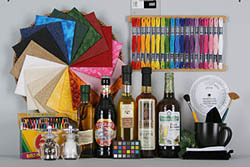 It delivers sharp images with good color rendition too. It does landscapes to portraits, very versatile focal range for almost anything. I think the price is a bit too expensive, but it pays up considering it will be the one that sticks to your camera most of the time. This is my upgrade from the 18-200 Sigma lens using a 500D body and a battery grip. At daytime, the lens is fast and very sharp. At night time or low light, you have to adjust the ISO or Shutter speed to get a fast and decent images. Looks and feel sturdy, not too heavy, a good partner with a prime lens 85mm or a telephoto 70-300mm for far distance subjects. You'll never regret having this lens for your day-to-day or walkround lens on an APS-C body (take note the quality is far better than the kit lens). Sharpness; Build Quality; very quick AF; non-rotating front element; position of focus ring; all-around great IQ. Barrel Distortion (mostly at short focal lengths); vignetting can be annoying, relatively slow. This is one sharp lens, with a very useful focal length range. Asking for any more would be quite greedy, but the only possible improvement with regards to focal length would be to have 1-2 more mm on the wide end to make it into the absolute city walkaround lens. It produces all-around great images in a very well-built package that, while not exactly rugged, could almost be called "classy". It feels very solid in your hands, yet is not very heavy at all. Moreover, the AF is very quick and completely silent, doesn't make the front element rotate, and the all-time manual focus ring is located where it is easy to use. However, the lens has to lose a point in IQ due to being seemingly very prone to distortion at the wider focal lengths, and to vignetting mostly at longer focal lengths (60mm+). It is also not a very fast lens, thereby requiring the use of flash indoors (which I am without at the moment of this writing, but which I imagine might do wonders combined with this lens), or switching to a fast prime. All in all, I'm very satisfied of my purchase of this lens. (I should also note I bought this lens as an upgrade from my 18-55mm kit lens for use with a 550D). For over a month or so, I spent reading reviews on wide angle zoom Canon lenses to make an upgrade to my EF-S 18-55mm 1:3.5-5.6 IS kit Lens. My intension was to buy a good walk around lens for all purposes. And after reading and analyzing each review over and over I drew a simple conclusion: there is no perfect lens in the optical world, especially regarding to wide angle zoom lenses. When it is quite sharp in the frame center, then comes softness in the corners along with vignette. By stopping down, you’ll see a better performance, but to spoil the party, going to tele-end suddenly appears slight chromatic aberration or barrel distortion or both, depending on the aperture you select. I don’t care much about vignette, because it sometimes helps me make good image composition. As to CA and barrel distortion, they’re easily corrected in post processing with specific software like DPP or CS5. I also considered third party lenses like Tamron’s and Sigma’s. They make good lenses, too. Eventually, after making up my mind, I purchased the Canon EF-S 15-85mm IS USM. I’m very impressed by the image quality this lens delivers. I’m not a pro, but I think the EF-S 15-85mm IS USM is a top-tier lens and it can perfectly be compared to the high lineup of “L” Canon lenses. I highly recommend this amazing 15-85mm IS USM. It’s a general purpose lens, once it expands very quickly from wide angle (15mm) to mid telephoto (85mm). The image Stabilization works perfectly well. The only cons I find in it is its high price you have to pay for. IQ, Very Sharp, light, well constructed. Not exactly fast, but its not designed to be. A clear improvement on the somewhat underated Canon 17 - 85. This is one sharp lens. Now the price had dropped it is good value. Its a shame it has not got L series build quality and weather sealing, but then it has not got L series price or weight. variable aperture, wish it was weather sealed. I've used this lens for about 6 months now and about 4,000 pictures. It is an amazing general purpose lens. I highly recommend it. It focuses very fast and accurately. If you pixel peep, I zoom in on eyebrows at 100% and have good resolution. I've compared images with this lens with most other general purpose zooms and the IQ of this lens is as good or better. Only images that I've seen that I'd consider better come from the 70-200 f2.8 II L IS, 70-200 f/4 IS or a "L" prime lens. A recent "real world" test. I was at my sisters wedding and took a lot of photos with this lens. She is using photos taken with this lens (on a Canon 7D) for her wedding album instead of the "professionally" taken pictures. The primary disadvantages of this lens are it's relatively slow and variable aperture and the fact that it isn't weather sealed. But you can't have everything and I'll take the focal length range as I mostly shoot outdoors where I love being able to go from 15 mm to 85 mm or indoors with a flash. I was looking for a good transstandard lens for my 7D, with high sharpness and image stabilization. Range is correct from wide to mini tele. I was not disapointed with this lens which is very good. Very nice image quality, it can take pictures in low light easily. I have no issue with the vignetting, thanks to peripheral illumination option on the 7d. I easily recommend this great lens !! This lens has become one my worst lens nightmares. I have had nothing but problems with it since I purchased it . The problems stem from inherant front focus issues. It is now back at the Canon Jamesburg, NJ service facility for the third time and they still haven't been able to fix it. Perhaps it's a bad sample not able to be repaired. It is still under warrantee. Canon was able to fix the front focus issue at the long end, but I live at the short (read: wide angle) end of the lens. Around 15 - 25mm end of this lens. Images are extremely soft at this end of the lens. Cannot get sharp images at infinity. Owning this lens has become a major lesson in frustration. I am forced to think about spending much more money on an L series lens. After owning many Nikon lenses, I never, ever had this problem with any of my Nikon lenses. Not sure what to do. I guess it's a mistake to be a slave to two masters, or at least in this case, a slave to one poor master. A must have for any APS-C shooter. This lens is my default walk-around lens. As such, it replaces the 17-55, which range isnt large enough for walkaround and I always felt short with that one. They both suffer from vignetting issues. The build quality of the 15-85 is slightly better than that of the 17-55. So is the IS. It bites a bit that Nikon makes it cheaper and even better. But all in all, Im very happy with this lens. Although it's not a cheap lens, you get more than what you pay for in this case. This lens was long overdue from Canon. Highly recommended for user with no plan to future upgrade to full frame body. I had the Canon EF-S 17-85mm f/4-5.6 IS USM and liked the flexibility but not the optical quality, too soft some times and a lot of Chromatic Aberration (CA), so I give it to my brother (he's happy with it ;-)). I bought the Canon EF-S 17-55mm f/2.8 IS USM and this is in other league, excellent resolution, very little CA and you can really use it at f/2.8, so nice but it's heavy and for a walkaround lens the range is limited. I decided to complement my optics with the Canon EF-S 15-85mm f/3.5-5.6 IS USM and just bought it. So far excellent in all respects mentioned in the Pros. Much much better to the old EF-S 17-85mm. Even the CA is much less than I expected, I don't know if mine is a golden sample but the CA in the borders of the frame are only important in the extremes of the range 15mm and 85mm, but nothing to worry for normal printing size and for those photos that you care is very easy to fix 100% in Lightroom (I always shoot RAW). Take in to account that my comments are based on the output from a 40D; being "only" 10MP is less demanding than the newer 15MP or 18MP cameras. Naturally there's some barrel distortion in the wide side (15mm) of the lens, but nothing different to what you get with all this kind of lenses (including the EF-S 17-55mm f/2.8 IS USM). The IS is great and I feel is even better than the IS in the EF-S 17-55mm f/2.8. I get close to the promised 4 stops. I'm from Mar del Plata, Argentina and got this lens recently and am very happy! Sharp, 4 stops image stabilisation, build and handling. I was astounded at the amount of stabilisation this lens offers. It makes available light photography a bit of a breeze as you can shoot at very slow shutter speeds. The lens feels solid and handles very nicely. Vignetting did not bother me and with 'peripheral illumination' selected on the 7D my pictures did not show any undue problems. All in all a great lens to have it will carry on nicely from the EFS 10-22mm lens in terms of focal length. I can't wait to get out and take some more photo's, which is what it's all about in the end, and this lens makes you want to do that! -IS performance is fantastic, delivers 4 stop or even more image stabilization. -construction quality is the best in canon's EF-S line. weight, wide angle, feel and looks! I have taken over 300 photos with this lens in the course of last weekend and love its handling, focusing, and ability to shoot very wide angles. I technically replaced the 17x85IS and am happy with the added advantages of a more precise lens with the ability to take better photos in my opinion. This new and more advanced glass seems to respond well to my needs which include acting as a great walk around lens.